A staggering 63 people have died from bath-time scalding and a further 1,124 people have been admitted to hospital with severe burns. More recently, a two year old was killed after suffering burns which then turned septic after her mother failed to seek medical attention. 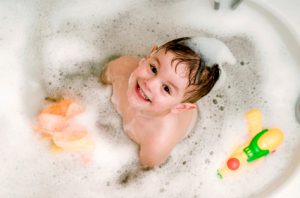 The toddler had been held under hot water reported to be 58 degrees centigrade. (Courtesy of HVP Heating Ventilating & Plumbing Magazine). An experienced professional heating and plumbing engineer will be advise domestic and commercial businesses about the importance of these devices being fitted to communal showers baths and taps. There is no law for these types of devices to be fitted but a professional plumbing engineer will advise the customer on the importance of fitting anti-scald devices and the obvious safety benefits of doing so. It is law however for a TMV2 to be fitted to a brand new bathroom! If the water temperature in your bathroom or work offices are too hot to wash your hands it might be time to get them checked! If you don’t want to scald your family or your employees and you want to bathe and wash safely then call us for an informal discussion now! A Care Home was recently fined £12,000 and ordered to pay costs of £5,133 after a resident staying in respite care received 13% burns by scalding whilst being hoisted under a shower. The HSE (Health and Safety Executive) found that the shower fitting was not fitted with a thermostatic mixing valve which would have limited the temperature to 41°c. The HSE also found that there was no adequate measures in place to maintain those TMV’s already in place or a properly recorded system for testing water temperatures. For all your heating, plumbing and water requirements contact Aquatech Services. For updates and news please follow us on twitter and facebook. Previous PostHow to manage the temperature of your home?Next PostCarbon Monoxide Headache – Kill Or Cure?